"I need a witness!" exclaimed the security screener at Ronald Reagan Washington National Airport. Because I had forgotten to remove my belt before going through a scanner, he explained, I must undergo an "enhanced patdown." I told him that if he jammed his hand into my groin, I'd file a formal complaint. So he summoned his supervisor to keep an eye on the proceedings. I thought of this exchange last week when the New York Times revealed that the Transportation Security Administration has created a secret watchlist for troublesome passengers. The TSA justified the list by saying that its screeners were assaulted 34 times last year, but did not release any details about the alleged assaults. The memo would be more accurate if it stated that anyone who fails to unquestioningly submit to all the TSA's demands would be found guilty of insubordination. As an attorney for the American Civil Liberties Union, Hugh Handeyside, told the Washington Post, the policy gives the agency wide latitude to "blacklist people arbitrarily and essentially punish them for asserting their rights." Rep. Bonnie Watson Coleman (D-New Jersey) expressed similar worry. "I am concerned about the civil-liberty implications of such a list," she said. According to the TSA, travelers can take consolation in the certainty that its agents will never assault them. But Americans have filed thousands of complaints that suggest otherwise, claiming screeners used excessive force or inappropriately touched them. How many have been fired as a result? It's hard to say: When I asked the TSA, they told me to file a Freedom of Information Act request. One ongoing court case is showcasing the TSA's prerogatives. Airplane captain James Linlor was traveling through Dulles Airport in 2016 when he suffered a brutal patdown that left him requiring surgery. 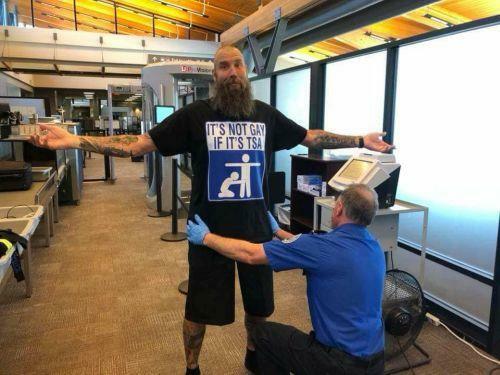 A TSA video shows that the patdown was proceeding normally, if somewhat aggressively, until the TSA agent, without warning, administered what appeared to be a karate chop to the captain's testicles. Linlor sued, claiming that the TSA violated his rights with an unconstitutional and unreasonable search. In a hearing last year, a lawyer for the Department of Justice argued that there's no law "establishing a specific degree of permissible intrusiveness of a security screening pat down," and that, since there's no law, Americans should have no legal recourse. Federal Judge James Cacheris scoffed at the government's "oratorical calisthenics." The case is now before an appeals court. The TSA has a long history of intimidation. In 2002, it created a system of fines to penalize travelers with bad attitudes, charging up to $1,500 for any alleged "nonphysical interference." This included any "situation that in any way would interfere with the screener and his or her ability to continue to work or interfere with their ability to do their jobs," according to a spokeswoman. The TSA failed to specify exactly how much groveling was necessary and eventually abandoned the regime of fines. If I have not yet made the TSA watchlist, it's not for a lack of trying. The agency's former chief, John Pistole, once claimed a 2014 article I wrote was "misleading, inaccurate and unfairly disparages the dedicated (TSA) workforce." The following year, after I endured a patdown in Portland, Ore., that nearly turned my private parts into a pancake, I raised hell in USA Today and elsewhere. The TSA's latest anti-privacy charade is yet more evidence that the agency should be done away with. After pointlessly groping countless Americans, the TSA has no excuse for groping more.